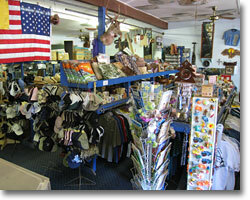 Well known by residents throughout Hawaii, Molokai Fish & Dive in Kaunakakai is packed to the rafters with everything that a person could need to have fun in the tropical sun. 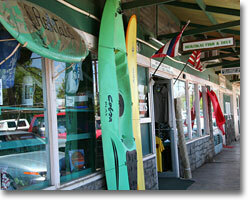 Over the years our Tours & Rentals Department has become the one-stop location for booking Molokai activities and tours. Whether it's ocean kayaking, Scuba diving, snorkel adventures, whale watching, cultural hikes or fishing, we can make the arrangements for all your Molokai activities. 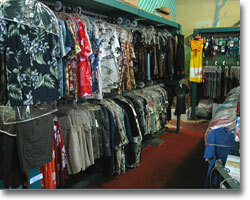 In addition to being the Island's complete sporting goods store, within its walls can be found the largest selection of authentic Molokai designed T-shirts and souvenirs on the entire island. Created by our staff members, the artwork is earthy and involved with the Hawaiian culture of Moloka'i. These exclusive designs have always been highly prized by residents and visitors alike and have never been available anywhere other than the store in Kaunakakai. 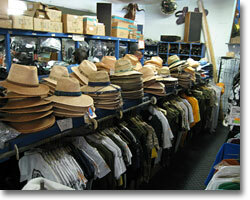 Now, a select few of these items are available to web surfers the world over. Over the years, author Jim Brocker, has taken thousands of superb photographs of Molokai and her people. Combining these photos with creative writing abilities he has authored Molokai's two best selling books. The Lands of Father Damien, released August 1998, immediately hit Hawaii's Best Seller list. The book deals with Molokai's Kalaupapa Peninsula, the people who were banished there and the dedicated priest, Father Damien. Containing 108 sepia-tone archival photos and 277 color prints, it is the largest pictorial publication in existence dealing with the events that took place in this desolate place. 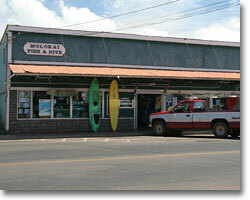 A Portrait of Molokai, Jim's previous book, is a must for anyone who has, or is planning to, visit the island. This 160 page book contains 375 color photographs that capture the spirit and beauty of this special place. 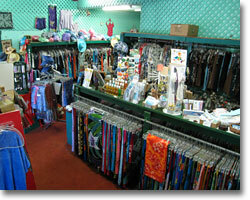 Written in true local style, it portrays Molokai as can only be done by someone who lives here. So, come on in. We're glad you're here!